Camille obtained her degree in Legal Management from the Ateneo de Manila University in 2009. 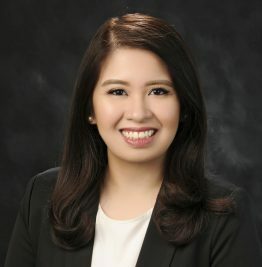 She graduated from the Ateneo de Manila University School of Law in 2013 as the class valedictorian. She joined C&G Law in 2016. Camille specializes in the fields of investments, mergers and acquisitions, corporate services, and banking. She has assisted several domestic and foreign companies in their investments and capital restructuring matters in the Philippines. Camille has also rendered advice on compliance requirements for corporations in highly regulated industries in the country. Assisting a multinational bank in the proposed restructuring between the members of its group in the Philippines, including the rendition of advice on compliance with the regulatory requirements of the Bangko Sentral ng Pilipinas. Advising a foreign bank on the regulatory requirements for the provision of cash sweep services and payment factories in the Philippines. Acting as local counsel lending foreign banks on its project financing of a coal-fired power plant. Advising clients on their investments in highly regulated industries, such as banking , energy and mining. Participating in transactions involving acquisitions of interests in various industries, including renewable energy. Assisting in conducting legal due diligence on corporate acquisitions, specifically on real estate and land-related aspects. Assisting in various applications and processes with the Securities and Exchange Commission, including setting up corporate vehicles and processing regulatory compliance requirements. Preparing advice on tax structures and compliance for corporations involved in mining, energy, and shipping. Assisting in various applications and processes with the Bureau of Internal Revenue, including tax treaty relief applications, requests for tax clearances, and applications for Importer Clearance Certificate. Assisting in various applications and processes with the Philippine Export Zone Authority. Providing general corporate housekeeping services to domestic and foreign companies. Re-Examining the Takings Doctrine in the Context of Cultural Preservation and Assessing Its Effects on Republic Act No. 10066 (2013), Juris Doctor thesis (Third Place Awardee, Best Thesis) Ateneo de Manila University School of Law. Two Competing Interests: A Study of the Effectivity of the 50% Creditor Approval Provision in Relation to the Court’s Cram Down Power Under the FRIA of 2010, 56 Ateneo L.J. 970 (2012). Who’s Afraid of the Truth? A Comment on Biraogo v. The Philippine Truth Commission of 2010, 56 Ateneo L.J. 166 (2011) with Candice Christine O. Tongco. The Legal Contours of Haute Couture, Ateneo Student Business Review (2009).